The peshwas were the hereditary prime ministers of the Maratha chatrapatis (kings), who later assumed the main position of power in Maratha politics. The word 'peshwa' has its roots in the Persian language, meaning 'foremost'. The peshwas were all Brahmin ministers who initially started out as the king's chief executive. Sonpant Dabir (1640-1652) was said to be the first unofficial peshwa. He was initially sent by Raje to advise his son Shivaji in his administration at Puna. The word 'dabir' however meant foreign secretary, but his most senior position accorded him a role equivalent to that of peshwa. Sonopant was said to have been granted the equivalent of his weight in gold coins at the Tuladaan ceremony at Mahabaleshwar by Shivaji, to honour the old man for his services to the kingdom. Shyampant Kulkarni Ranzekar (1652-1657), was the second Peshwa, and he was probably removed from his post by Shivaji following some allegations of mismanagement. Moropant Trimbak Pingale bore the official title of pant pratinidhi (1657-1683). He was the third person to be declared peshwa (and the first one officially) during the coronation of Shivaji as chatrapati. Moropant was not just adept with the pen, but also with the sword. In 1659, he was part of the group of warriors that led an assault on the forces of Afzal Khan, the Bijapuri commander. Moropant was instrumental in capturing Fort Trimbakeshwar at Nasik. He also assisted Netaji Palkar during the Battle of Wani Dindori, and during the raid on Surat. Moropant Pingale developed the Shaniwar Peth at Pune. He was also instrumental in supervising the construction of Fort Pratapgad, which was designed by Hiroji Indulkar. Moropant Pingale also provided his services in the financial administration of the Maratha kingdom. After the death of Shivaji in 1680, his son Sambhaji accused Moropant of conspiring against him (during the time of Sambhaji's power-struggle with his step-mother, Soyrabai. Sambhaji accused Moropant of siding with his step-mother). Sambhaji had him temporarily removed, only to reinstate him later. Moropant died in 1683. Nilkanth Moreshwar (Nilopant) Pingale (1683-89), the son of Moropant, succeeded his father as the next peshwa to serve Sambhaji. He had earlier served as Shivaji's Muzumdar. 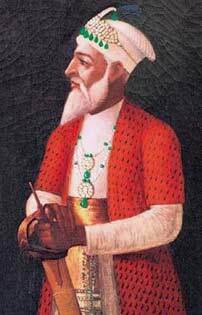 He was instrumental in recovering Fort Purandar from the Mughals in 1670, and capturing its kiledar, Raziuddin. He later developed the Shukrawar Peth and Rawiwar Peth in Pune. Ramchandrapant (Bahutkar) Bawdekar (1689-1708) rose from the rank of a kulkarni (accountant) to being an important minister (amatya), serving under the rule of Shivaji, Sambhaji, Tarabai, Rajaram and Shivaji II. When Rajaram escaped to Jinji in 1689, he gave Ramchandrapant the hukumatpanha (a position replacing the peshwa) or the authority to administer the kingdom on his behalf. In 1689, Rajaram replaced Ramchandrapant with Tarabai (the wife of Rajaram) as the bearer of the hukumatpanha. But Ramchandrapant was transferred to an equally important advisory position. Ramchandrapant sided with Tarabai during the power struggle with Shahu, which is when the latter sidelined Ramchandrapant and appointed Bahirojipant Pingale as his peshwa. Ramchandrapant was an asset to the Maratha empire during the difficult times and tackled many adverse situations such as a shortage of resources and a scarcity of food with remarkable skill. He penned his experiences with administration in his book, Adnyapatra. Ramchandrapant died in 1716 at Fort Panhala. Note: During the time of Rajaram, the post of pant pratinidhi was almost on a par with the post of peshwa. The first pant pratinidhi was Prahlad Niraji. Later this post was occupied by Parshuram Trimbak Kinhaikar, who later became the first jagirdar of Aundh, a position which wasretained by his descendents. He was instrumental in holding Fort Panhala against Aurangzeb in 1689. Though he lost the fort that time, he recaptured it in 1692. He also captured territories between Miraj and Fort Rangana and took Bhudargad, Chandangad, Pavangad, Satara and Vasantgad. He maintained his loyalty towards Tarabai much to the chagrin of Shahu, who had him imprisoned twice between 1710-1714. The second of these periods of confinement ocurred when his son Krishnaji joined the forces of Sammbhaji II. But despite this, his life was spared by Shahu due to the intervention of Khando Ballal (Shahu's personal assistant), who reminded his king of Parshuram Trimbak's contribution to the Maratha cause. Parshuram Trimbak continued holding the position of pant pratinidhi at the time of Tarabai until his death in 1718. He was succeeded by his son, Srinivasrao, otherwise known as Shripatrao, who continued in his post, albeit as Shahu's vassal jagirdar of Aundh. Bahirojipant Pingale (1708-1711) was the son of Nilopant Pingale and Shahu's first peshwa. When Kanhoji Angre attacked Satara in 1711, Bahiroji was taken prisoner by him. Shahu ordered Balaji Vishwanath to ensure the release of Bahiroji, and also gave authority to Balaji Vishwanath in the form of the post of peshwa, so that he could negotiate with Angre on the king's behalf. 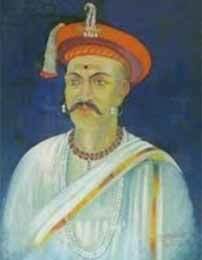 Balaji Vishwanath Bhat (1713-1720) was the progenitor of the Bhat peshwas who became the de facto rulers of the Maratha kingdom for over a century. The Bhats (Balaji and his elder brother Tanoji) were Chitpavan Brahmins hailing from Shrivardhan in the Konkan region. They probably started in the service of the Siddis of Janjira and later shifted their base to the ghats. There they took service, first with Ramchandrapant (who acted as a sab suba, administrator, of Puna and later Daulatabad), and later with Dhanaji Jadhav, the sarnobat of the Maratha army (following the recommendation of Abaji Purandare). Dhanaji Jadhav sent Balaji Vishwanath (who was a diwan, or revenue officer, at the time) on a confidential mission to ascertain Shahu's credibility. Satisfied that Shahu was indeed a son of Sambhaji, Balaji went back and persuaded his master, Dhanaji, to join his forces to those of Shahu. 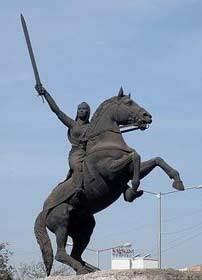 Both Dhanaji and Balaji ensured the defeat of Tarabai's armies and she had to retreat to Kolhapur where she formed a separate minor kingdom, with Shahu ruling the main Maratha territories from Satara. On one occasion, a person by the name of Dhamaji Thorat (a protégé of Ramchandrapant Bavdekar) kidnapped Balaji, and Shahu had to pay Thorat a huge ransom to get him released. Shahu then dispatched Dhanaji's son, Chandrasen Jadhav (whom he had made his senapati after Dhanaji's death), along with Balaji, to chastise Dhamaji Thorat. But Chandrasen, who resented the ascendancy of someone like Balaji who was once his father's servant, quarrelled with him over a minor matter. Seeing Shahu taking Balaji's side, Chandrasen transferred his allegiance to Tarabai. But in this hour of trial, Balaji stood like a rock behind Shahu. Balaji not only helped Shahu in his administration, but also borrowed money from moneylenders on behalf of the king and rebuilt the army so that it was once again strong. In 1712, Balaji hatched a conspiracy with Sambhaji II, another son of Rajaram, and helped him oust his step-mother, Tarabai, from the throne of Kolhapur. Chandrasen Jadhav was beaten in battle by Shahu's able commander, Haibatrao Nimbalkar. Chandrasen later switched allegiance to the likes of Sambhaji II and later Nizam ul Mulk. But every time his misadventures against Shahu came to naught. Balaji Vishwanath then proceeded to Konkan with a large army, which unnerved Kanhoji Angre to some extent. But Balaji was wise enough to understand the importance of a person like Kanhoji Angre if he came over to their side. Therefore, instead of attacking Kanhoji's army, he started discussions with Kanhoji Angre. Eventually Kanhoji agreed to accept Shahu as his overlord and in return Kanhoji Angre was made sarkhel (admiral). He was also allowed autonomy in his regions. In 1718, Dhamaji Thorat was also defeated and taken prisoner. Many other enemies such as Udaji Chavan, the Ghorpades, and Krishnarao Khatavkar were also subdued. Thanks to his achievements, Balaji Vishwanath gained Shahu's trust and soon became his most important minister. Meanwhile, following the death of Aurangzeb, there were no major skirmishes between the Marathas and the Mughals. In fact Prince Azam had promised Shahu the sardeshmukhi of certain subahs. But Prince Azam was killed during the war of succession and Bahadur Shah ascended the Mughal throne. Bahadur Shah, though not hostile, dillydallied over the issue of the viceroyalty of the Maratha subahs to Shahu and was undecided on whether to support Shahu (though the Mughal viceroy of the Deccan, Zulfikar Khan, did support Shahu's cause), or support Tarabai instead. Balaji Vishwanath made Abaji Purandare his mutalik and Ramajipant Bhanu (an ancestor of the famed Nana Phadanvis, the chief minister of Sawai Madhavrao Peshwa) his phadnavis. During the reign of emperor Jahandar Shah, the Marathas launched an attack on Mughal territories, forcing Daud Khan, the Deccan deputy of Zulfikar Khan, to accept the passing of the rights of sardeshmukhi to Shahu. In 1713, Farukhsiyar ascended the Mughal throne. Zulfikar Khan was then assassinated in Delhi and his post was given to Chin Qilich Khan, otherwise known as Nizam ul Mulk. Nizam ul Mulk was always hostile to the Marathas whom he viewed as impediments to his proposed overlordship of the Deccan. He pushed Farukhsiyar to refuse to adhere to the agreement of sardeshmukhi between Daud Khan and the Marathas. He also tried to create an anti-Shahu lobby by supporting Shahu's old rivals, such as Sambhaji II, Chandrasen Jadhav, Rambhaji Nimbalkar, etc. But politics in Delhi took a new turn and Nizam ul Mulk was substituted with Sayyad Hussain Ali Khan, the brother of the wazir, Sayyad Abdullah Khan. The Sayyids were also initially hostile towards the Marathas, but a sequence of events made them change their strategy. Matters had soured between the Sayyad brothers and Farukhsiyar. The latter began to resent the growing power of the Sayyad brothers. Farukhsiyar tried to persuade his commanders, such as Daud Khan, and the Marathas against the Sayyid brothers. The Marathas, however, avoided involving themselves in the power struggle in Delhi. The Sayyid brothers then sought Maratha help in overthrowing Farukhsiyar. In 1718 , they concluded a friendship treaty with the Marathas, whereby the Marathas were to acknowledge the overlordship of the Delhi throne in return for the viceroyalty of six provinces in the Deccan (including Malwa, Berar, Bundelkhand, and Gujrat). Farukhsiyar opposed this treaty as he sensed the growing friendship between the Sayyids and the Marathas. (Balaji Vishwanath was instrumental in streamlining the administration of the Maratha kingdom. To enable the better collection of the chauth (one fourth of the land revenue) and the sardeshmukhi (one tenth of the chauth) rights, he patronised selected people who kept their own armies in order to collect the revenue. They were allowed to keep the major part of the revenue so as to maintain their armies and rest was to be transferred to the state. Though this paved way for legalising the sovereign rights of those individuals over their regions, it also made the revenue collection system much more efficient with little cost to the state's exchequer, as in order to maintain their lifestyles and armies these people made a diligent effort to collect the revenues from their regions of influence. This also lead to the diaspora of talented Marathas in central and western India. Sayyid Abdullah Khan then urged the Marathas to march on Delhi and depose Farukhsiyar. Balaji Vishwanath was dispatched to Delhi by Shahu with a large contingent assisted by other Maratha commanders such as Khanderao Dabadhe. Rajput Rajas of Marwar (Ajit Singh) and Amber (Jai Singh) also offered their support to the Sayyid brothers, as did Nizam ul Mulk, who resented Farukhsiyar's move to dislodge him from Delhi. In 1719, Farukhsiyar was replaced by Rafi Ud Darjat as the Mughal emperor of Delhi. On his way back, Balaji Vishwanath, also secured the release of Shahu's mother, Yesubai, his wife Savitribai, half-brother Madan Singh, and many Marathas who were earlier taken as captives by Aurangzeb. On his return, Balaji Vishwanath established himself at Puna (Pune), which became the headquarters of the peshwas who succeeded him. Balaji Vishwanath wasn't able to enjoy his success for long. He died soon after in Saswad, near Puna, on 12 April 1720. Balaji left behind a wife, Radhabai, two daughters and two sons, Bajirao I and Chimaji Appa. He was succeeded by Bajirao I as the next peshwa. 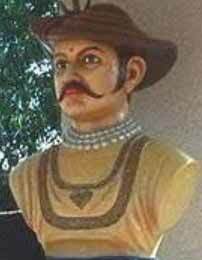 Note: Kanhoji Angre (born 1667, died 4 June 1729), also known as Konaji Angria, was the son of Tanoji Angria, a commander under Chatrapati Shivaji. Kanhoji was born in Alibaug and was brought up at Fort Suvarnadurg. He grew up to be a skilled sailor. He was appointed sarkhel / darya sarang (admiral) of the Maratha navy and controlled areas from Mumbai to Vengurla on the western Konkan coast. He was induced into Shahu's services by Peshwa Balaji Vishwanath, who declared him to be the sarkhel (earlier, Kanhoji was on the side of Shahu's rivals and was initially hostile to Shahu). Kanhoji also gained notoriety as a high sea pirate when he looted the ships of the Mughals and the Europeans. Kanhoji left behind two legitimate sons; Sekhoji and Sambhaji, and three illegitimate sons, Tulaji, Manaji, and Yeshaji. After Kanhoji, his son Sekhoji continued the Maratha exploits at sea until his death in 1733. After Sekhoji's death, the Angre might was split between two brothers, Sambhaji and Manaji, due to divisions in the family. With the Marathas neglecting the navy the British soon found it easier to defeat the remnants of the kingdom. The Angre reign over the western coast ended with the capture of Tulaji in a joint Anglo-Peshwa attack on the fort of Gheriah (now Vijaydurg) in February 1756 (Balaji Bajirao was facing insubordination from the Tulaji Angre, who had become very powerful and refused to accept the peshwa as his leader, and made the short-sighted mistake of accepting English help to decimate the strength of the Angres). 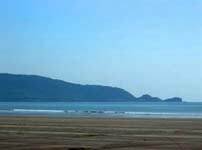 Kanhoji was also said to have constructed three naval forts, at Gova, Kanakdurg and Fatehgad.